NEST is a futon, Innovation Cup Award Winner! Futon has its origins in ancient Japan, where it guaranteed the fighting samurai a good night's sleep. The futon retains the same core values: correct ergonomics, great comfort and ventilation - everything for your body's well-being. Title : Comment from Marie D.
It's really a pleasure to sit or lie with equal comfort. Lounge, living rooms, parents' room, children's place is everywhere. 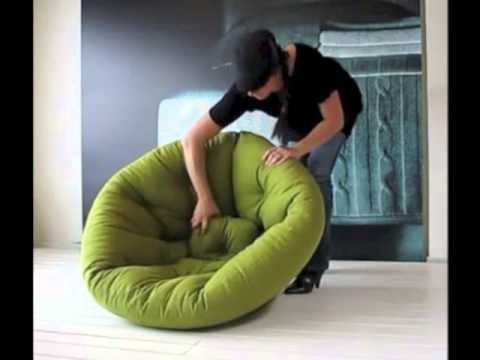 Assemble two NEST and you have a beautiful Futon 2.20 m in diameter! Your NEST will be well protected with this extra cover. The healthy characteristics of the futon are now expressed in NEST - peace, comfort and warmth, through refreshing colours and materials, all combined to create this inviting and embracing lounge furniture. Thickness of the mattress futon : 14 cm - 8 layers of recycled cotton. The padding provides buttons for maintaining efficient packing for better quality and sleeping comfort.